a coat of arms or simple heraldic symbol, such as a shield. 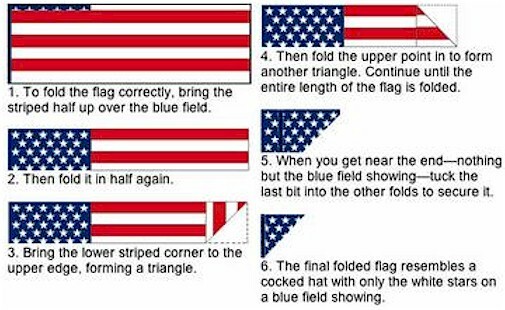 any quarter of a flag, but commonly means the upper hoist (left) quarter, such as the field of stars in the flag of the United States or the Union Flag in the Australian Flag. a narrow edging or border, often in white or gold, on a flag to separate two other colors. For example the white lines of the South African Flag. Hoist – the act or function of raising a flag, as on a rope. Lower – the act or function of taking down a flag, as on a rope. Half Staff or Half Mast – a style of flag display where the flag is flown halfway beneath the top of the flagpole. Saginaw NewsBob Heft, designer of the fifty-star American flag.Robert G. Heft, who designed America's 50-star flag as a high school project in 1958 and lived in Thomas Township upon his retirement from teaching, died Saturday. 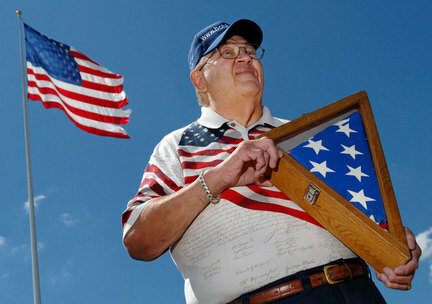 Heft, whose design overtook the 48-star banner as the longest-serving flag in U.S. history on July 4, 2007, was 67. Wakeman Funeral Home representatives say Heft died at a hospital in Saginaw. A cause of death wasn't immediately available. As a junior at Ohio's Lancaster High School in 1958, Heft, who was born in Saginaw, needed a project idea for his American history class. He found his calling when he came across the story of Betsy Ross, creator of the country's original flag. Armed with an idea, Heft took his family's 48-star flag and removed the blue portion of the banner. It took him nine hours to cut out the 100 fabric stars needed to cover each side of the flag's top corner, he said. Heft went the 50-star route because of speculation that Alaska and Hawaii would become states. President Dwight D. Eisenhower chose the design. "I never thought when I designed the flag that it would outlast the 48-star flag," he said in 2007. "I think of all the things it stood for in the past, the things we've done as a nation that we're proud of. It's not a perfect country, but where else would I like to live?" He returned to the Saginaw area to live in Thomas Township after retiring from Northwest State Community College in Archbold, Ohio, where he was a professor. Despite his fame, Heft said in 2007 that the people of Saginaw County simply point him out like it's no big deal. "I put my pants on one leg at a time just like everybody else," he said then. "I'm just Bob Heft. Public Law 110-181, Section 594: signed by the President 28 January 2008. SEC. 594. CONDUCT BY MEMBERS OF THE ARMED FORCES AND VETERANS OUT OF UNIFORM DURING HOISTING, LOWERING, OR PASSING OF UNITED STATES FLAG. Section 9 of title 4, United States Code, is amended by striking "all persons present" and all that follows through the end of the section and inserting the following: "all persons present in uniform should render the military salute. Members of the Armed Forces and veterans who are present but not in uniform may render the military salute. All other persons present should face the flag and stand at attention with their right hand over the heart, or if applicable, remove their headdress with their right hand and hold it at the left shoulder, the hand being over the heart. Citizens of other countries present should stand at attention. All such conduct toward the flag in a moving column should be rendered at the moment the flag passes". (History) 07/25/07 WASHINGTON, D.C. - U.S. Senator Jim Inhofe (R-Okla.) today praised the passage by unanimous consent of his bill (S.1877) clarifying U.S. law to allow veterans and servicemen not in uniform to salute the flag. "The salute is a form of honor and respect, representing pride in one's military service," Senator Inhofe said. "Veterans and service members continue representing the military services even when not in uniform." "Unfortunately, current U.S. law leaves confusion as to whether veterans and service members out of uniform can or should salute the flag." "My legislation will clarify this regulation, allowing veterans and servicemen alike to salute the flag, whether they are in uniform or not." "I look forward to seeing those who have served saluting proudly at baseball games, parades, and formal events." "I believe this is an appropriate way to honor and recognize the 25 million veterans in the United States who have served in the military and remain as role models to other citizens." "Those who are currently serving or have served in the military have earned this right, and their recognition will be an inspiration to others." To amend title 4, United States Code, to prescribe that members of the Armed Forces and veterans out of uniform may render the military salute during hoisting, lowering, or passing of flag. SECTION 1. CONDUCT BY MEMBERS OF THE ARMED FORCES AND VETERANS OUT OF UNIFORM DURING HOISTING, LOWERING, OR PASSING OF FLAG. Section 9 of title 4, United States Code, is amended by striking `all persons present' and all that follows through the end and inserting `those present in uniform should render the military salute. Members of the Armed Forces and veterans who are present but not in uniform may render the military salute. All other persons present should face the flag and stand at attention with their right hand over the heart, or if applicable, remove their headdress with their right hand and hold it at the left shoulder, the hand being over the heart. Citizens of other countries should stand at attention. All such conduct toward the flag in a moving column should be rendered at the moment the flag passes.'. Passed the Senate July 25, 2007. AN ACT To amend title 4, United States Code, to prescribe that members of the Armed Forces and veterans out of uniform may render the military salute during hoisting, lowering, or passing of flag.